Many observers think California urban areas are more geographically expansive ("lower density" or to use the pejorative term, more "sprawling") then those elsewhere in the nation, especially the Northeast Corridor, which runs from the Washington DC metropolitan area through Baltimore, Philadelphia, New York, Hartford, Providence to Boston. This obsolete view is a leftover from the pre-automobile city of more than a century ago, when the largest American cities (metropolitan areas) had far higher urban densities, smaller suburban expenses, and no cars. Then, the principal method of urban mobility was walking, though transit had a virtual monopoly on motorized mobility. During the 1920s, automobiles began to dominate and automobile oriented suburbization had its early beginnings. In 1930 there were 90 motor vehicles in the United States for each 100 households. Now, more than 85% of the 53-major metropolitan area (over 1 million population) residents live in the suburbs (or exurbs), leaving less than 15% in the urban cores, according to the City Sector Model, which differentiates between urban cores and automobile-oriented suburbs (Figure 8). The suburbs are even more dominant in California, with 91 percent of major metropolitan area residents. Still, there is a widely held view that California's urban areas are less intensively developed than others around the country, especially in the Northeast Corridor. Indeed, some urban cores resembling the pre-automobile cities remain in the Northeast Corridor. Yet, these urban cores are vestiges of another era, surrounded by suburbs that are nearly as automobile oriented as the suburbs of dispersed metropolitan areas such as Orlando, Phoenix or Portland. Population densities have plummeted so much that today Boston’s overall urban density (including its dense urban core) is only 2,200 per square mile, less than one third that of Los Angeles, often seen as the very definition of "sprawl." Even more remarkable, the Boston urban area covers more land area than Los Angeles, according to the Census Bureau. If Los Angeles were populated at the urban density of Boston, only 3.9 million residents would have been counted in the 2010 Census, instead of the actual 12.1 million. The Los Angeles urban area, as well as San Francisco and San Jose urban areas are also denser than New York. In 2010, New York had 51 percent more residents, but covered 99 percent more land area. 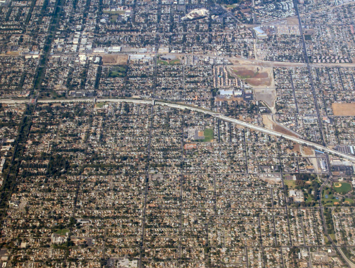 The high suburban density of Los Angeles is illustrated by the photograph above, which is of the Ontario and Upland area, bisected by the San Bernardino Freeway (Interstate 10), approximately 35 miles east of downtown Los Angeles. 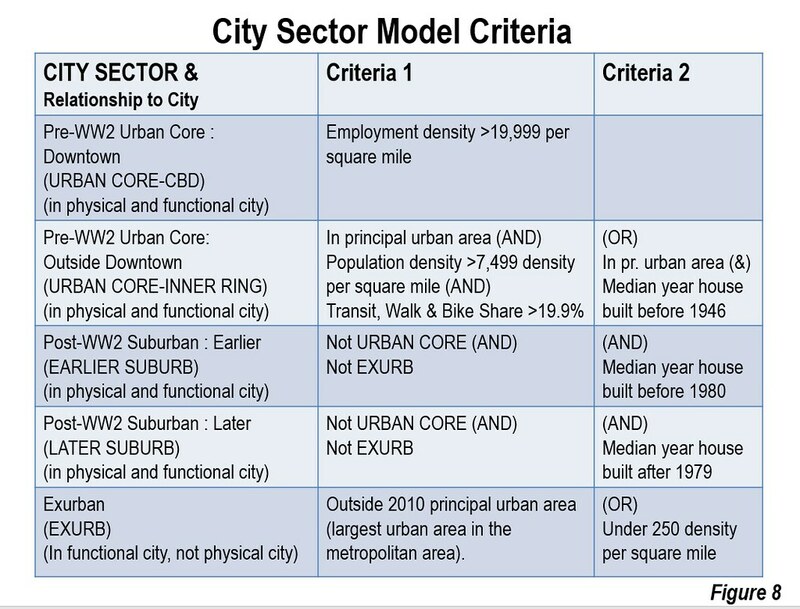 This analysis that follows analyzes the urban densities within the principal urban areas of the major metropolitan areas, using the City Sector Model. For this analysis, a tailored set of geographical regions has been selected for comparison to "Coastal California," which includes the Los Angeles, San Francisco, San Diego and San Jose urban areas. Because of the concentration of some of the nation’s largest metropolitan areas, including four of the transit legacy cities (New York, Philadelphia, Boston and Washington, municipalities that comprise 57 percent of the nation’s transit commuting destinations, but only seven percent of the jobs) the Northeast Corridor is also analyzed. These four metropolitan areas include four of the nation’s six largest downtowns (Central Business Districts). The Northeast Corridor also includes Hartford and Providence. The other three regions include one that encompasses the entire Midwest as well as three metropolitan areas over the Appalachian Mountains from the Northeast corridor (Pittsburgh, Buffalo and Rochester). Another is the South, but excludes Washington and Baltimore, which are in the Northeast Corridor. The last region is the West, which excludes coastal California though does include Riverside – San Bernardino and Sacramento in California. Figure 1 compares the urban core, suburban and overall urban densities by the regions delineated above. The Exurban category is excluded, because it is virtually all outside the principal urban areas (Note). Perhaps surprisingly, the urban core population density in Coastal California nearly equals that of the Northeast corridor while the suburban density of Coastal California is more than double that of the Northeast Corridor. The overall urban population density of Coastal California is at least 60 percent higher than the urban areas of the Northeast Corridor. 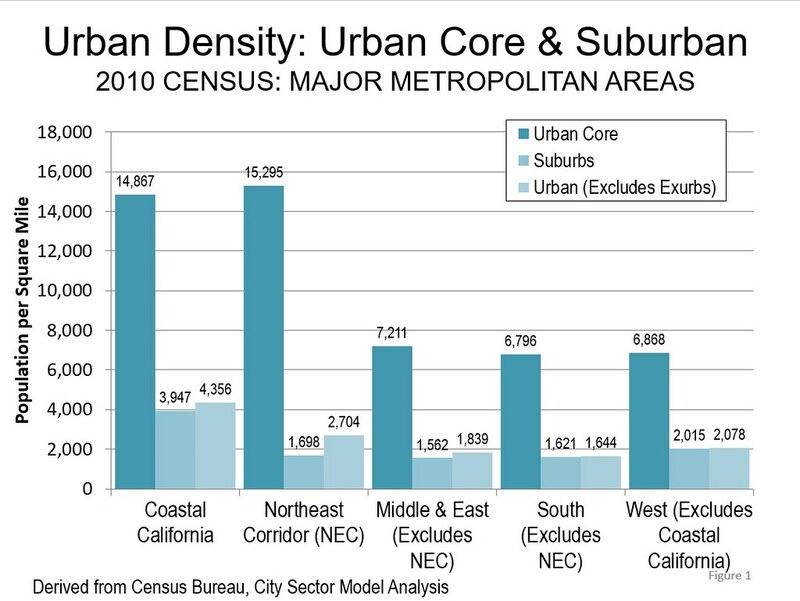 The urban core, suburban and overall urban densities in Coastal California are well above the densities of each of these categories in the other three regions. Moreover, despite their reputation for high density, the urban areas of the Northeast Corridor are only a little more densely populated than those of the Middle and East and the South. Perhaps more surprisingly, the suburbs of the West, excluding Coastal California, are at least 15% more densely populated than in the urban areas of the Northeast Corridor. A more detailed examination is provided in Figure 2, which compares densities among the Earlier Suburbs and Later Suburbs. The New York urban area is broken out of the Northeast Corridor, to illustrate the fact that California suburbs are considerably denser --- nearly 90 percent ---- than those of the nation's largest urban area. In addition, the population density of both the Earlier Suburbs and Later Suburbs are also higher in the West, outside Coastal California, than in New York. 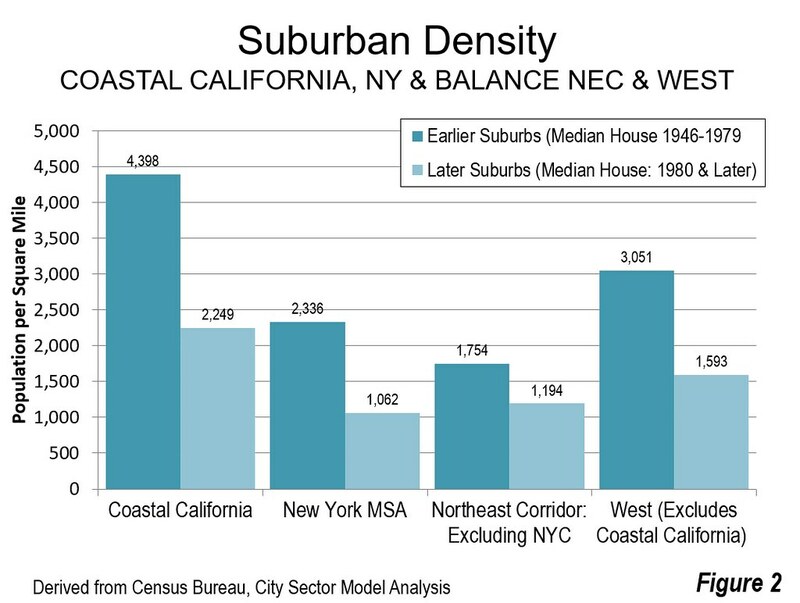 Figure 3 compares individual metropolitan area urban core densities in California with those of the Northeast Corridor and for all metropolitan areas in the nation outside California. 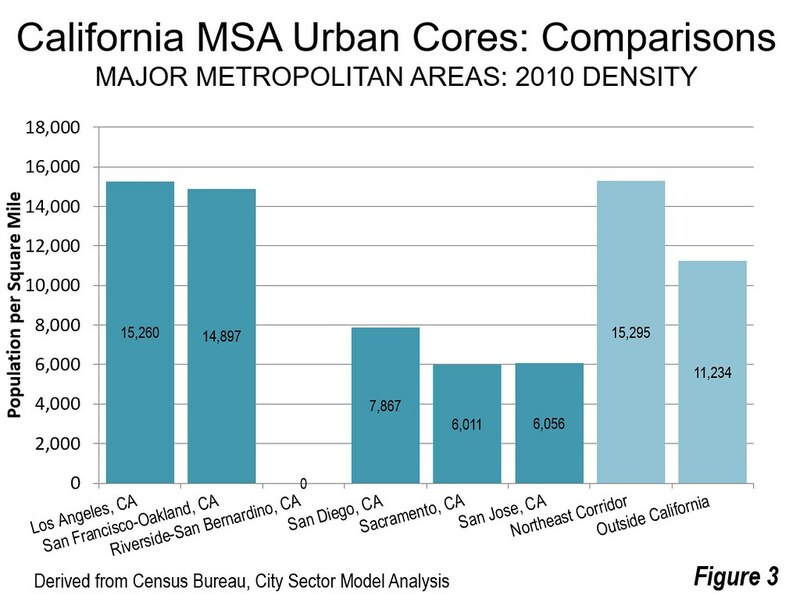 Both the Los Angeles and San Francisco urban cores are nearly as dense as the urban cores of the Northeast Corridor and about one third denser than the urban cores outside California. The urban cores of San Diego, Sacramento and San Jose are well below those of the Northeast Corridor, Los Angeles, San Francisco and outside California. This is to be expected, since each of these three metropolitan areas did not achieve significant size until after the sunset of the transit and walking era. 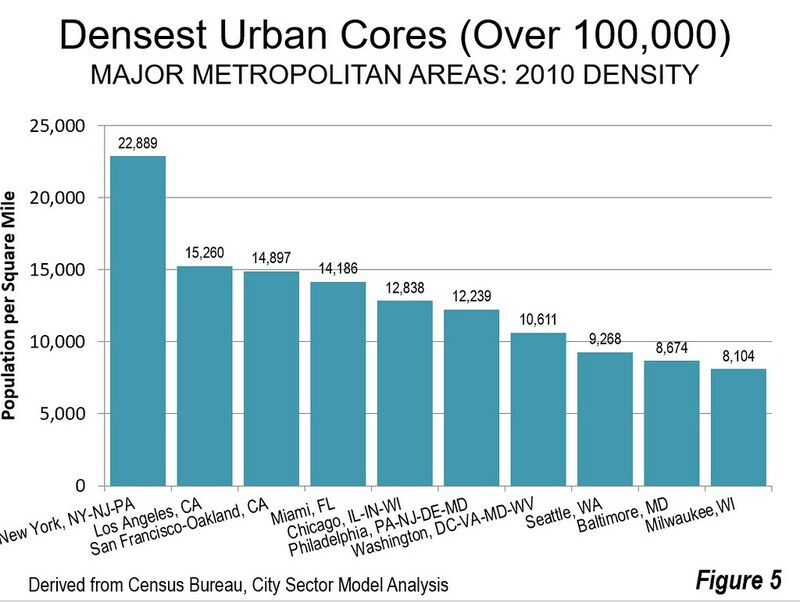 Figure 5 illustrates the 10 densest urban cores among those with more than 100,000 population. Not surprisingly, New York has by far the highest density at nearly 23,000 per square mile. Indeed, New York represents 41 percent of the urban core population of major metropolitan areas. New York’s urban core population, at 10.3 million, is more than four times that of Chicago, which has the second largest urban core, and more than six times that of third largest Boston and fourth largest Philadelphia. Los Angeles has the second highest urban core population density, followed by San Francisco. Other metropolitan areas such as Chicago and Philadelphia, often perceived to have higher densities, have lower urban core population densities than Los Angeles and San Francisco. 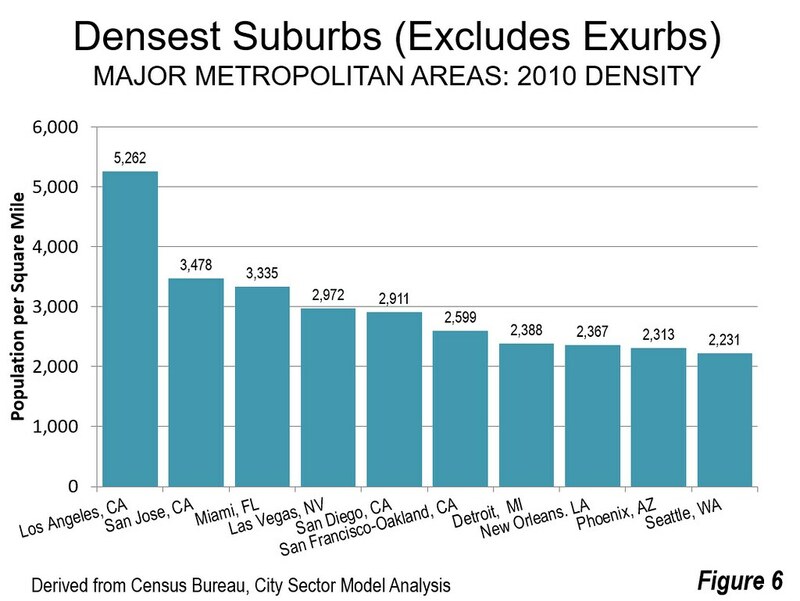 Figure 6 shows the major metropolitan areas with the 10 densest suburbs, led by Los Angeles and San Jose. Miami and Las Vegas ranked third and fourth, followed by San Diego and San Francisco. 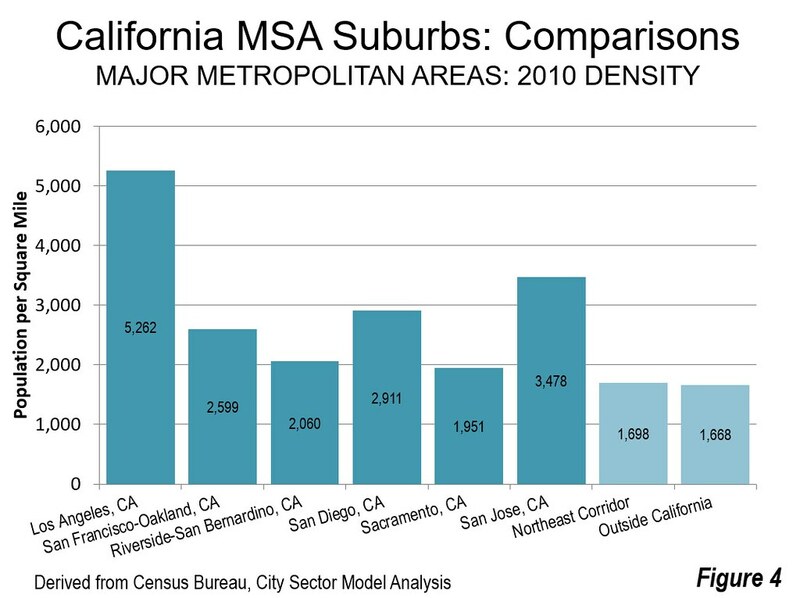 Four of the 10 densest suburban components are in California metropolitan areas, while seven are in the West. All of California’s major metropolitan areas have more densely settled suburbs than Portland, Oregon, which is renowned for its densification policies. In addition to the four coastal metropolitan areas, all ranked in the top 10, the suburbs of Riverside-San Bernardino rank 15th, while Sacramento ranks 20th, both ahead of 23rd ranking Portland. 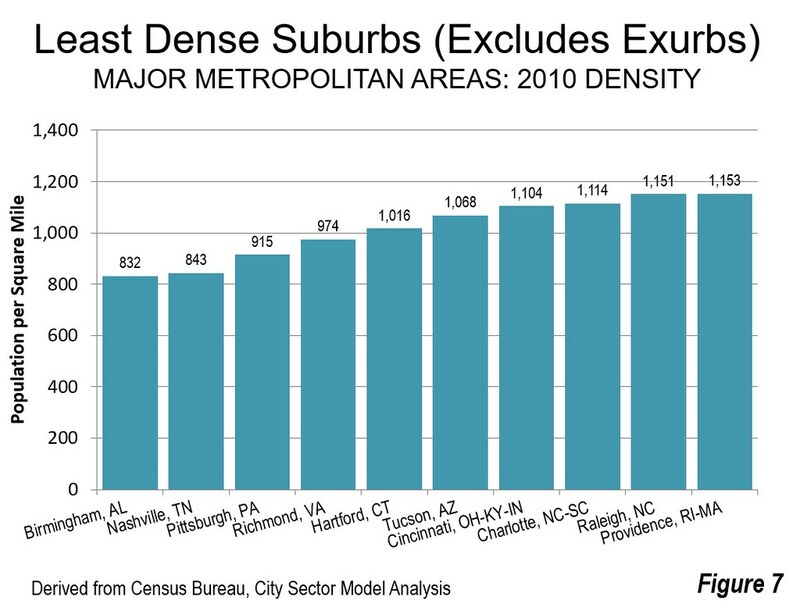 Figure 7 shows the major metropolitan areas with the least dense suburban areas. Birmingham, Nashville and Pittsburgh have the lowest suburban densities. Only one metropolitan area from the West, Tucson, ranks among those with the lowest suburban densities. Given the already elevated level of density, proposals to cram more people into already settled areas of California could worsen the quality of life. California’s high urban densities are accompanied by the worst traffic congestion in the nation and some of the worst in the world. With plans in place and more proposals to increase densities, this can only get worse. Regrettably, transit access cannot possibly substitute for auto access (see: Connecting the Dots in Los Angeles, an analysis that would be virtually the same for every other urban area in the United States). Moreover, policies that seriously limit development on the urban fringe distort the market and have already driven house prices up. That is likely to continue. Photograph: Densely settled suburbs approximately 35 miles east of Los Angeles (Ontario and Upland), by author.